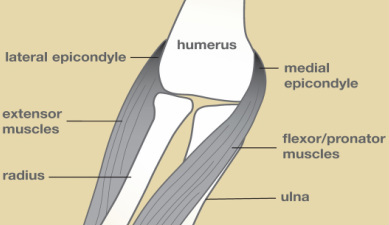 Golfer's elbow, or medial epicondylitis, is caused by inflammation of “flexor/pronator” tendons at the point of their insertion at the inner aspect of the elbow called the medial epicondyle (see Figure 1). The "flexor/pronator" muscles are located in the anterior forearm and are involved with flexing the fingers and thumb, and flexing and pronating the wrist. All of their tendons come together in a common tendon sheath, which inserts at the medial epicondyle. Golfer's elbow can be caused by repeated swinging stress to the elbow, especially if the non-overlapping grip is utilized. It may result from many other non-golfing activities, such as heavy lifting and hammering.This conditions is usually first treated with rest, physical therapy, and non-steroidal anti-inflammatory medication. If the initial treatments fail, your elbow specialist may recommend steroid injections, which may provide you some pain relief. In a small percentage of patients, the non-operative treatment is unsuccessful, and a surgical procedure is necessary to remove or repair "flexor/pronator" tendons. Figure 1. Elbow showing muscles as they originate from medial and lateral epicondyles.